SAN FRANCISCO (CNS) — Despite the last-minute scheduling of a large Women’s March less than two hours after the 13th annual Walk for Life West Coast, tens of thousands of pro-life supporters filled Civic Center Plaza and walked the 1.7 miles from City Hall to Justin Herman Plaza in San Francisco Jan. 21. “There so many people, it was crazy,” said walk co-chair Eva Muntean, who had worked closely with police and held conversations with the organizers of the Women’s March to ensure a smooth transition between the two events. “The police were out in full force and did a great job throughout the day,” said Muntean. Despite days of rain, including heavy rain and wind in the morning, the rain held off until the walk’s conclusion. “I thought the weather and the Women’s March might have reduced turnout, but that was not the case,” said Muntean. About 50 protesters supporting legal abortion gathered on a sidewalk adjacent to where a group of pro-life demonstrators unaffiliated with the West Coast pro-life walk had set up a Jumbotron with graphic images of aborted babies. A wall of balloons from the walk organizers attempted to block the images from those passing the spot about midway along the route. A line of police on motorcycles and on foot formed a barrier between the Jumbotron organizers, abortion demonstrators and the Walk for Life participants. 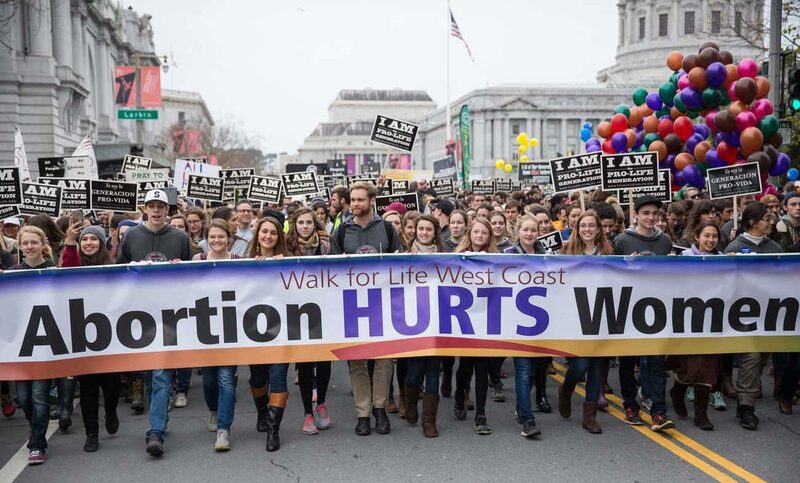 The Walk for Life West Coast, founded in 2005, is a nonpartisan event held on the Saturday closest to the anniversary of the U.S. Supreme Court’s Roe v. Wade decision legalizing abortion. This year, President Donald J. Trump’s inauguration sparked a hastily organized nationwide series of Women’s Marches the same day, with San Francisco’s march at 3 p.m., shortly after the pro-life walk rally concluded. “This is your time. This is your season,” Rev. Childress said. Rev. Childress referred tacitly to Trump’s pledge to appoint pro-life Supreme Court justices, defund Planned Parenthood, and block foreign aid to organizations that provide abortion. “It is a season where God is moving on behalf of those who have labored for so long,” the pastor said. Rev. Childress urged prayers for Democratic and Republican leaders in Washington. The Women’s March in San Francisco took the same route as the Walk for Life but started at 3 p.m. It also drew tens of thousands of supporters, many carrying coat-hanger signs signaling support for abortion. In San Francisco, organizers said they welcomed pro-life supporters but the national Women’s March on Washington expelled a pro-life group and all the marches were heavily promoted and supported by Planned Parenthood, NARAL Pro-Choice America and other groups that support legal abortion. Speakers at the Walk for Life were a cross section of pro-life advocates. Reggie Littlejohn, founder of Women’s Rights Without Frontiers highlighted the abuse of women by China’s forced abortion policy where as many as 23 million abortions a year are performed. Littlejohn introduced the two girls, Anni and Ruli, she and her husband are raising in the U.S. because of persecution in China due to the activism of their father, Zhang Lin, who was just recently released from prison. Melissa Ohden who survived a saline abortion spoke of her journey and urged Christian love toward women who abort, those who promote abortion, and those in the abortion industry. Pam Tebow, mother of Heisman Trophy winner Tim Tebow, spoke of carrying her son to term despite doctors’ advice she abort. The West Coast walk opened with an invocation by Bishop Steven J. Lopes, who heads the Personal Ordinariate of the Chair of St. Peter based in Houston, and a message of support from the papal nuncio conveying Pope Francis’ support was read by San Francisco Archbishop Salvatore J. Cordileone. Archbishop Cordileone presented the West Coast walk’s St. Gianna Molla Award to Dr. George Delgado of Culture of Life Family Services in San Diego for his pioneering work on a procedure to reverse the abortion pill. Schmalz is assistant editor at Catholic San Francisco, newspaper of the Archdiocese of San Francisco.